The bosses have their media – we should have ours! We rely on your support. Hundreds of prison officers are today marching through Westminster demanding action against soaring levels of violence, an end to private prisons, and a fair retirement age of 60. Setting off from the Trafalgar Square end of Whitehall at 11am, POA members and supporters will rally at Methodist Central Hall will hear from fellow trade unionists and MPs from across the political parties, introduced by POA national chair Mark Fairhurst. Shadow Chancellor John McDonnell and Shadow Justice Secretary Richard Burgon are the headline speakers. They will be joined by party colleagues Ian Lavery, Jo Stevens, Laura Pidcock, Imran Hussain, Mary Glindon and more, alongside the SNP’s Chris Stephens and Plaid Cymru Westminster leader Liz Saville Roberts. ASLEF general secretary Mick Whelan is also speaking, along with PCS general secretary Mark Serwotka and, union-news-co.uk understands, FBU general secretary Matt Wrack. 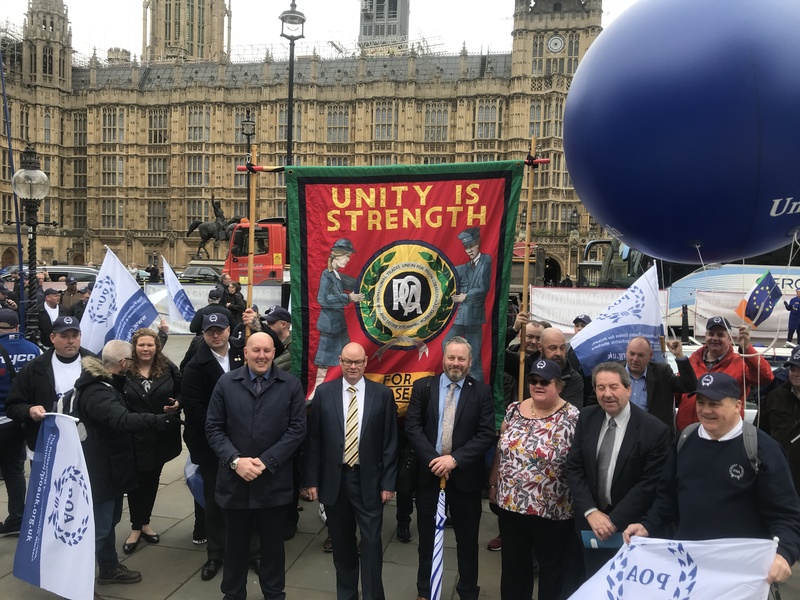 Following the last-minute suspension of a planned strike by PCS members working as security guards in Parliament, POA members will now lobby their MPs in the Palace of Westminster after the rally. If the PCS action had gone ahead, they would have lobbied outside the Parliamentary estate in solidarity. POA general secretary Steve Gillan said: “We may be banned by law from taking any kind of industrial action, but they can’t take away our right to protest. “We are here in Westminster to hold the government to account for causing this prisons crisis. My members face record levels of violence – day in, day out – simply for doing their job. This is a health and safety emergency, and the government must immediately return the money it stole from the prison service in the discredited name of austerity. “New private prisons are not the answer – with their record of overcrowding, understaffing, more violence and worse terms and conditions than at public prisons. The government must end its ideological obsession with running prisons for profit. POA national chair Mark Fairhurst added: “I am proud to represent POA members who serve the public in all secure environments and wish to express my sincere thanks to them for the dedicated, professional and dangerous work they perform in the most hostile and violent workplace in Western Europe. Like this story? Please support our work here. Share with a friend, colleague or comrade! Our stories on your feed.